Yes... a weaving project to share with you! I finished the eight yard warp the day before we left to see our new grand daughter. I cut it off and I must say that there is nothing as satisfying a a big fat roll of cloth sitting heavy in your lap as you enjoy the results of your labours! I found the pattern in the Design Collection 16 on Kitchen Towels and its shown there as a bread cloth. There was something about it that really appealed to me. It must have been all the Vav magazines I have been scanning lately, especially one on stripes. Scandinavian linens have such simple clean lines, bold colours and simplicity in their weave structure. Its uncomplicated. So I entered the draft into my weaving program and modified it to suit my needs and searched for yarn in the stash. I have an interesting dilemma with my 8/2 cotton stash. I have one cone of this and a part cone of that. Maybe two full cones of this colour but nothing to really go with it. A lot of yarn still but not really working together either in quantity or colour. I had a lot of snowy white and natural beige. I felt that white would be too stark a contrast and so went with the natural. My next choice was royal blue as I have a Denby dish set that compliments that shade. The third colour was a khaki / green/ beige to be a soft intermediary between the two. I used a 20 epi sett as that's good for both plain weave and the Swedish lace and made my warp twenty five and a half inches wide in the ten dent reed. Each towel was woven to a length of thirty four inches in total, so I had to work out various measurements of borders, striped cross section and the lace area in the centre. Its kept me busy keeping track! I found that the draw in was quite pronounced right from the start and so quickly added a temple to the warp and I had to beat *very* firmly. The cream plain weave actions went quickly with a nice fast pace and the cross stripes slowed me down to a crawl. A nice balance! I kept them separate from the other five towels and thought if I couldn't get the stains out, then we would have two new towels for our kitchen instead of one. I pressed and pined the hems with a neat double fold over and did a running blind stitch to hem them. It gave me something to do while I rested on the couch, leg elevated and with a gel pack on my knee! So here are the beauty shots.... and I must say I love them! The plain weave turned out nicely and is a 50/50 balanced weave. The plaid sections are (mostly) squared, well, close enough for me! The lace section in the middle is more of a nubbly texture which would make for great absorbency. Its also a nice contrast if used as a table centre or tray cloth. The lace doesn't pull and make little holes as in huck lace, being only four threads. The lightness of lifting four shafts was easier on my knee. It brought home to me that the simplicity of a four shaft project has all its own complexities to balance: even beat to maintain, selvedges that show up even more, uneven warp tension is less forgiving etc..... so you still have to 'weave well'. What's next? I have decided to go with another four shaft project next to take it easy on the knee as it settles down but still keep it exercised. My eight shaft project was bumped to next time if all goes well. As a closing 'gift'... here's a simplified diagram of how to make a weavers knot. I found this on a Pintrest board and no identifying source to quote. It looks much like a bowline I struggled to learn back in my sailboat days in the 1980's. We used to say: The rabbit come up from the hole in the ground, goes around the tree and goes back down the hole.... but its exactly where it goes down that counts! In the wrong spot, the knot will fail and you can't undo it..... and in the right spot, it holds tight and can be undone. Much like Life huh? Oh.... The stains came out by the way.....no trace of them left and no fading of the three colours. Meet "Madison Ava" born March 10th, 2015 and weighed 8 pounds, 2 ounces. Yes, that's me cuddling her. She's a very calm and cuddly baby. When she sleeps, her whole body relaxes. Some newborns still stay clenched with arms and legs folded up. Not this little girl! 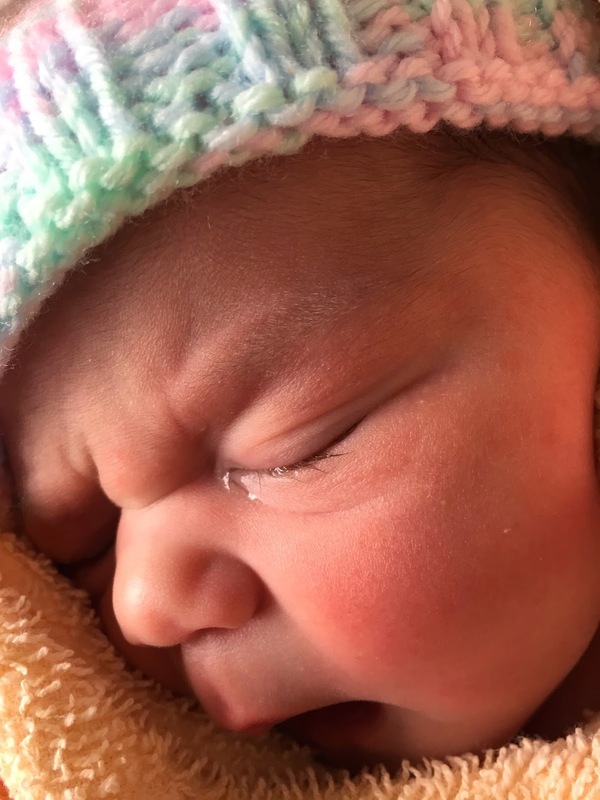 This was our first peek at her on her actual birth day. The hat looks large on here there but its only three to four inches across and is *very* tiny! We headed over to meet her and see Ethan this past Friday. Bruce fell in love with one look! Okay, maybe Nana fell hard too with my first cuddle. We are working on a burp here! Everything is so brand new! Then there was Ethan, who will be three in April. He is the complete opposite of his calm sister! Constantly on the move, constantly talking in full sentences, and with intermittent shrieks! Ethan is also train crazy. This pleases Grandad Bruce, a retired locomotive engineer, to no end! We gave him one toy Thomas the Tank engine way back when he was first born. Then his parents surrounded him with many other toys and play centres, but he found that train and hasn't looked back since! Here we are giving him a new stool with a train on it. He can now get closer to the sink wash his hands or help with the dishes. He watches Thomas the Tank on the iPad. The only time he's quiet outside of his bed at night I might add. .....or better still, you play train crash with Grandad! Grandad's train fell down the hill in what must have been the worse crash of Bruce's railway career! The blanket finally made its final destination and put to use right away. That makes a weaver feel good! Also in the last eight days, to add to the joy, my long time bachelor brother announced he and his lady are now engaged! No date set as yet. Then my daughter got married this past Friday in Colorado! She and her new husband live in the Denver, Colorado area. Then finally, my dear Dad is being released from hospital today after being admitted in January. His situation was touch and go for awhile, so going home again must feel very sweet! All that's missing is the lottery win...... but I think we already have done that! I have a new tool in the studio! 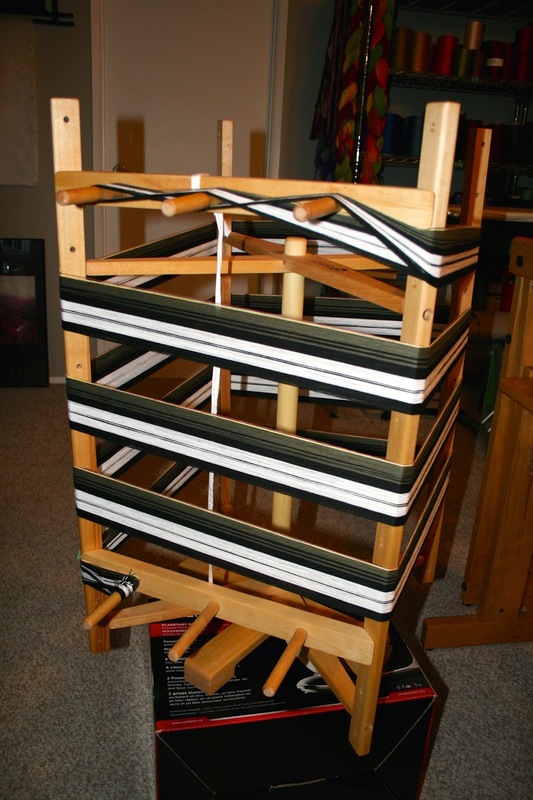 A warping mill or warping reel. It has a two yard diameter and can hold up to 20 yards. I suspect that would be rather fine stuff! The yarn in the pictures is eight yards of 8/2 cotton for a future plaid project. It was a bit awkward at first and by the end of two full bouts of my four to be done, I was a whirling blur and landing the sweet spots on each corner! 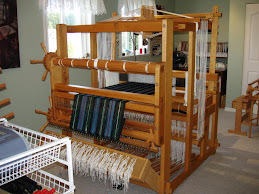 What's on the loom now? Well here's a sneak peak.... yup, more 8/2 cotton. Approximately eight yards of it for seven towels. Half dozen for the Etsy shop and one for us, plus some samples (or a bread cloth if there is enough warp.... fingers crossed!). Weaving is under way now and of course, the knee sets the pace. My right side feels fine now and its like nothing was done three months ago! Just a wee bit of swelling late in the day but it doesn't hurt. So this was my last warp wound on the warping board for some time. It was peculiar and long time getting it done. The 600 +/- ends were done in short sprints where I would stand and wind like crazy and then sit to take a break and rest my knee. It took many days to get done. I ordered the warping mill on day one when I saw the difficulties. May I also add that the warping mill is on sale at Woolhouse Tools so that was a nice surprise! Nana bought a new frame for the latest picture of our favourite grandson, Ethan. He will be three in mid April. Where has the time gone? I actually bought two new frames.... as our new grand daughter and Ethan's sister will be born tomorrow by Cesarean section. Her spot is there next to her brother already... Yes, you can expect baby pictures next post! Her new blanket is wrapped and waiting for her arrival. Speaking of time, here's another picture. (click to enlarge) That's my son Chris (who is Ethan's Dad) and my recently newly engaged daughter Carrie, with Bruce and I back in approximately 1987. Yes, I'm wearing a pair of 'high' high heels and so not normally that tall next to Bruce. We were at a family member's wedding. Yesterday, Calli went and got her spring haircut and came home with a girly floral bandana. She had 100% more energy and raced around the house. She's coming up to being five years old this spring. Our weather has been unseasonably warm and so she had to get all the long hair off. (Sorry if you still are surrounded by snow banks, or heading into winter down under). Our part of Canada has enjoyed a mild winter with only one or three small snow falls and only one serious cold snap.